Just done – the piecing for Blushing Peonies is completed. Fiddly! More than once I opened seams and rotated/repositioned small 4-patch blocks because a colour was next to the same colour in a larger block. I took apart large sections of the middle portion of the top in order to center the large bordered block. At this point, I have to say I’m please with the colour flow and can live with the symmetrical layout. Same block size – same number of blocks (more or less) – but in this first version, my 16″ blocks were background, neutral, used to showcase the bright 8″ blocks. The strong turquoise block draws the eye to the central portion of the quilt and the large blocks in three of the corners fade away. Your eye moves to the other 8″ blocks in turn and then picks up the colour flow of the small blocks, but not really ever landing on the three large corner elements. 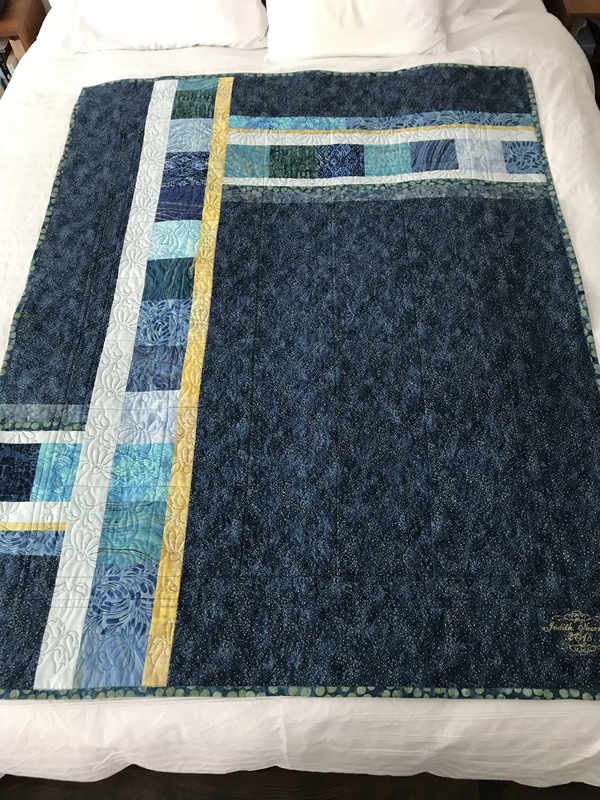 So in this quilt asymmetry allowed me to make the 8″ blocks the focus of the quilt. 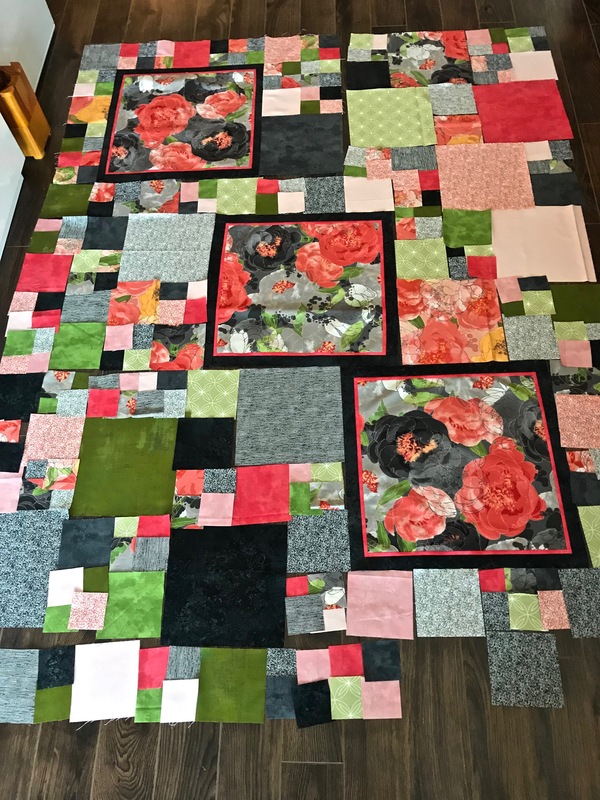 In Blushing Peonies, having decided to border the three 16″ blocks and make them the focus of the quilt I was forced to arrange them in a diagonal with symmetrical placement. The 8″ blocks don’t capture your attention, and the smaller 4″ and 2″ blocks just fill in colour around the three large blocks. In this case I managed a viable asymmetry – but the final quilt dimensions were wrong – it wanted another 4″ in the length and if I had put a 4″ row on one end, I would have wanted a complementary 4″ column on the right side – which would have distorted the width/length ratio. So I opted for inserting the 4″ between the middle and the bottom and centering the large block. Now the question is – do I frame the piecing with a narrow border (in which fabric)? Do I bind it conventionally, or use a hidden binding and allow the pieced edges to border the quilt? I have enough each of the red mottled and grey mottled fabric to construct a backing with some kind of insertion – not sure yet which to use – it will likely turn out to be the grey to tone down the back in relation to the top. I need to sleep on all of this before doing anything more. It’s been an interesting exercise – I’ve learned a lot more about colour and design by doing this quilt. I did not anticipate the decisions I’d run into before I started out. (someone) asked today about a “scant” quarter-inch seam allowance. A variety of responses were given, from “it doesn’t matter as long as your seam allowance is consistent” to “it DOES matter if you want things to fit.” The best answer included a link to this video, which explains exactly why a good seam allowance matters. 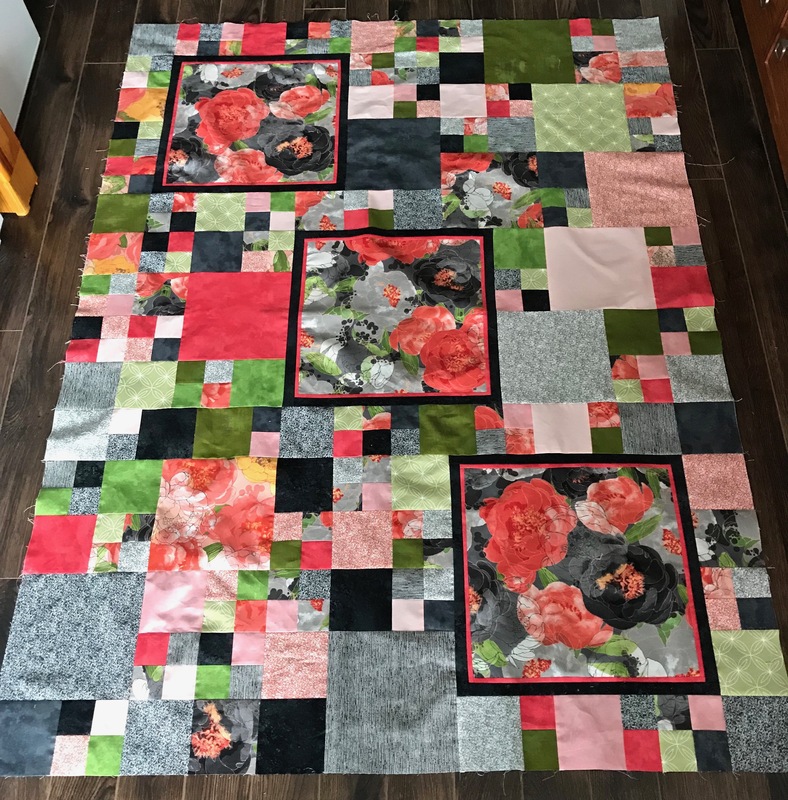 This Blushing Peonies quilt top is an example of when it does matter – in order to get all the small 4-patch blocks to fit the 4 1/2″ squares, etc. I needed careful scant 1/4″ seam allowances. There have been instances where I haven’t needed to be so vigorous about the seam allowances but here (and with the Wandering Geese quilt) I had to be meticulous. Watch the video if you’re interested in what this discussion is all about. It’s done. Quilted and bound with a label. A vanishing 9-patch quilt with borders built from ~80 charm squares. I’m pleased with the scattering of the small yellow blocks – they appeared when the assembled 9-patch block was recut into four – the yellow central block became four small corner squares. The distribution of colour also has worked out well. 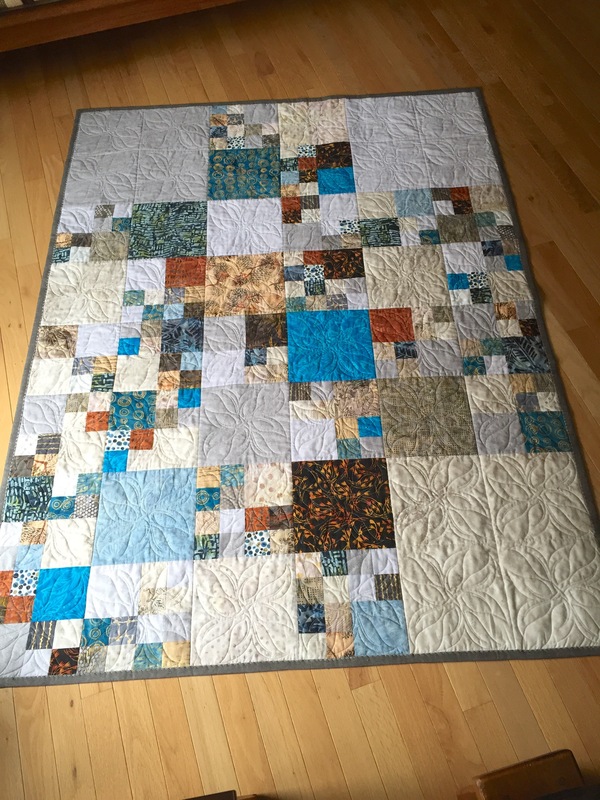 The pale inner border ties the central pieced panel nicely, the narrow yellow border provides accent and the dark wide outer border balances out the quilt. For the back I selected a few squares from the second charm pack I’d bought (in case) and cut an equal number of batik squares to set up the bordered strips. The backing fabric is the same fabric I used for the borders on the front – didn’t have quite enough to cover the top so had to create a horizontal stripe as well. I reversed position of the two pieces when I added in the vertical strips to add further interest to the back. The quilt is now in the growing collection of quilts to be shown in Parrsboro in July/August. It won’t be for sale since it already has a home with my physiotherapist. I think it fits the bill for her – she didn’t want it so fancy that she felt she couldn’t just throw it on her sofa. 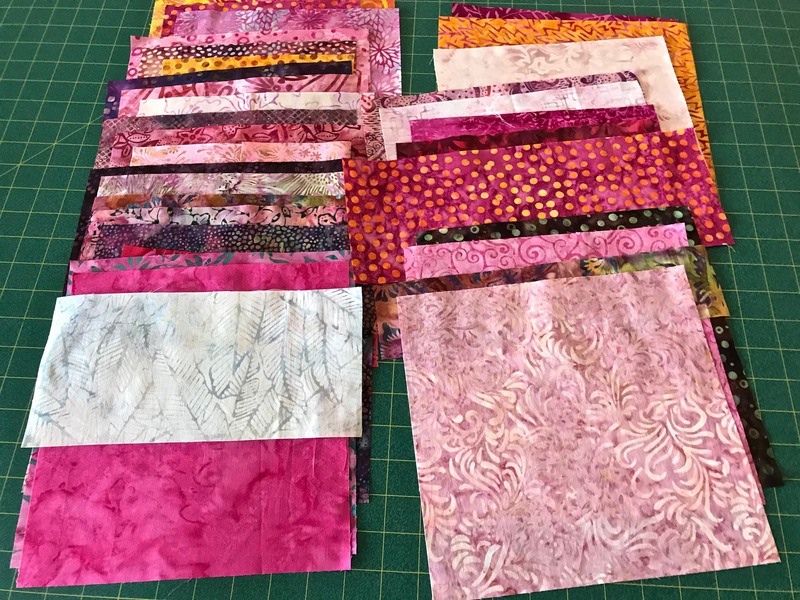 I’m hoping overall a sense of pink will predominate – there are lots of other hues in these fabrics but I’ve tried retaining pink (or a sense of pink) in each fabric chosen. I also discovered I had four gold/pink 10″ squares in one of my fabric boxes so I included them in the collection. I’ve used one, so far, for block construction. Looking at the eight blocks I’ve done I think I’ll continue with linear elements rather than including curves (like drunkard’s path). I can see from the photo that I need more elements using the golden leaves fabric. I may also want a small amount of another colour for contrast but so far I have no idea what that might be. All of these disparate elements will get fit together with whatever sashing is necessary to assemble them into sections that I can stitch relatively easily. I’ve got about half of the elements I will eventually need for a good size lap quilt. I’m getting closes to having to make some dimensional decisions so I can start putting these pieces together. The difference between a triangle-in-a-square block and a flying geese block is the height/base ratio – a traditional flying geese block is half as high as it is wide; a triangle-in-a-square block is closer to being square (it could actually be square if the height and base of the triangle – it would have to be an isosceles triangle – were equal). In my case I used an equilateral triangle so my blocks are a bit shorter than they are wide. I might construct some that are square. I also want to do a couple of other traditional blocks on a small size scale to increase the detail of the piecing. Anyway, I will carry on. I have a couple of weeks to get a quilt top pieced before the group gets together again. I’ve been teaching a class today on “Improvising A Quilt”. The women came with fabrics and ideas and wanting to explore ways of improvising on an idea and taking it somewhere. What surprised me was to what extent the particular fabrics called for specific treatments. This one in particular – two complementary 1m cuts of Asian ombre prints both going from light to dark. They shouted out “conversion quilt“. Jen hadn’t ever tried a conversion quilt, although I’d included a picture of one I’d made a while back and I happened to take that quilt to the class with me this morning. So convergence quilt it became. 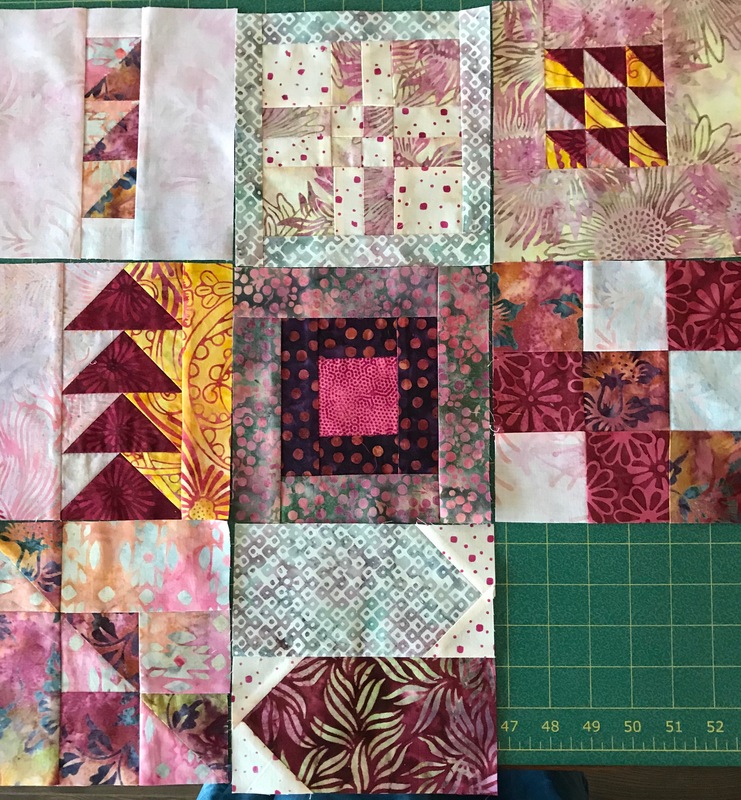 Here it is – 22″ blocks cut from narrow to wide strips, interleaved and pieced, then cut again into narrow to wide strips, and interleaved, not yet pieced. This is going to be just lovely. The flow of colour and print detail is elegant. We don’t know, yet, how this quilt will develop beyond this central convergence panel but Jen has enough leftover fabric to come up with something that will work well with the panel. This wasn’t the only fabric calling out for a particular treatment. Sheila had fabric to make something for her grandson – a fabric with images of soccer players, and three other fabrics with soccer balls, shoes. You have to keep the pictures of the soccer players intact – sash each then assemble them into some kind of quilt top? In the end she decided to offset the angle of the players which meant creating paper piecing templates for the odd shaped sashing elements and because the soccer player blocks were all different sizes, she decided to make all the blocks the same size which will make assembling the quilt top much easier. She’s gone home with four blocks completed. The sashings are all cut out and ready to be stitched to the soccer player images. 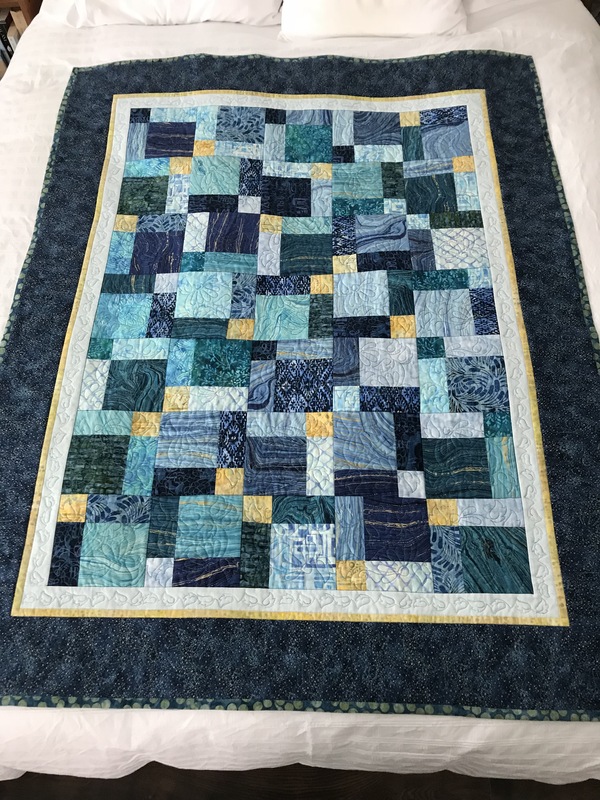 Nancy wanted to create a bed runner with Christmas fabrics using a slash and stitch technique – cut out blocks, slash them, piece in a narrow strip (usually 1″ which ends up 1/2″ wide), slash again, and piece, and maybe even a third time. She began with some red and green fabric scraps and inserted brightly coloured strips – but the focus was on the narrow strips. 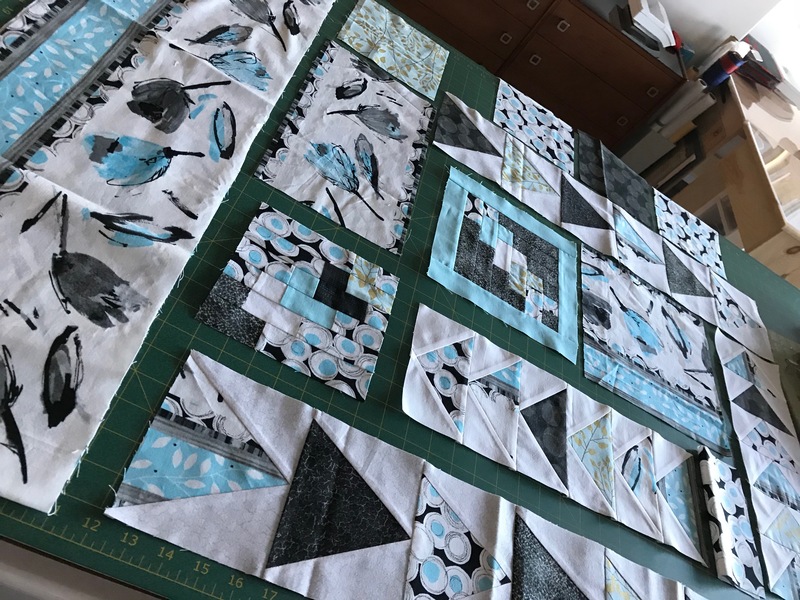 In the end she has elected to use a dark grey “grunge” fabric for the insertions which brings the focus back to the fabrics used for the blocks. Interesting how the fabrics dictate what has to happen! We meet again in three weeks – enough time to complete piecing a quilt top. Then we’ll work on doing something interesting with the backs, discuss “in-the-hoop” quilting and get set up to complete the quilts. Looking forward to seeing how far they will have come. With the medallion quilt completed, today, I turned to clearing up the piles of stuff in my sewing room. 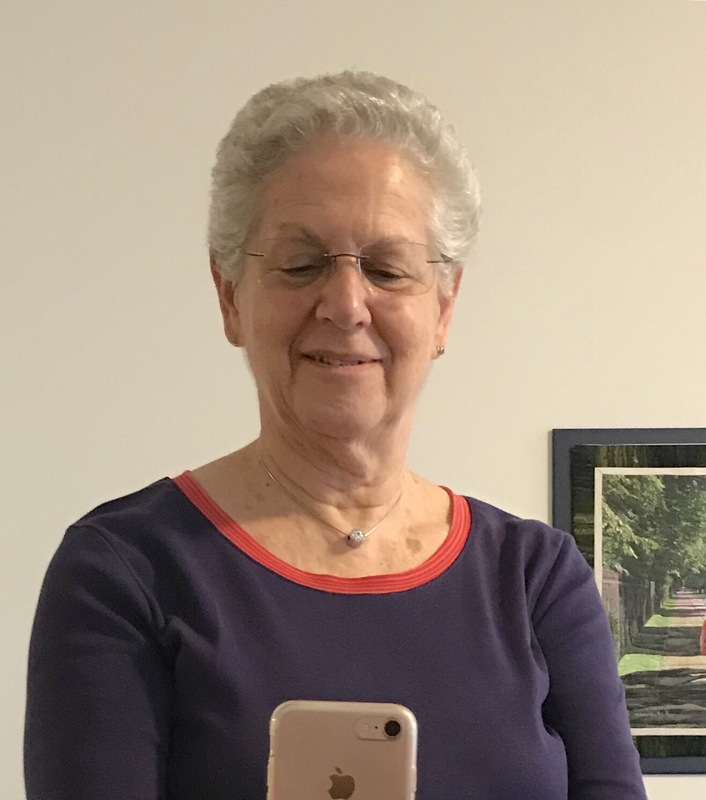 At least six weeks ago I pulled four t-Shirts from my closet with the intention of lowering the neckline. The shirts had originally been high crewneck long sleeve t-Shirts which I’d bought so I could shorten the sleeves and end up with sleeves just above my elbow – that’s not something you can purchase, trust me. It’s true, t-Shirt weather is just about over here in Nova Scotia – maybe one more day warm enough to put on a short sleeve top. But these shirts are now ready for next warm season.